OUTDOOR DOG TOY PITCH DOG ISN'T A CHEW TOY SO DON'T LEAVE IT UNATTENDED. DOG FRISBEE PITCH DOG CAN BE QUICKLY DESTROYED. Dog soft ring is not just a dog toys or dog frisbee. It's a completely new flying disc from which all dogs will be delighted. Thanks to this fitness tool your dog will get a load (in only 20 minutes, as for a full training with a Pro coach) on all muscle groups and will be in a great shape. -There is a unique soft material in dog treat toy. -Does not sink in water. -Wet dog toy is universal for all breeds and sizes of dogs. -It has the positive effect on the gums and teeth of your dog (reduces tartar and does not damage the teeth and gums). -Best dog toys are great for playing outdoors and indoors. -It is non-toxic and does not contain harmful substances, it is friendly to the environment. -Small dog toys do not cause irritation, allergies and food poisoning. -Bright, durable coloring, it will be easy to find in high grass or in water. -Does not have an unpleasant smell. -Suitable for interactive games and training with a dog. 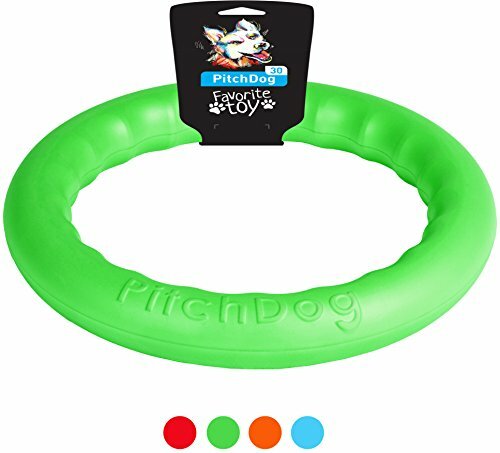 Large and small dogs - dog training toys is great for puppies and adult dogs, for big and small dogs, for active and lazy dogs, all dogs play and train with great pleasure with our Soft floating rings PitchDog. Dogs of all breeds and sizes like to play and train with a dental dog toy, even those who ignore the game with other dog rings made of rubber or plastic. If you have any questions about this product by PitchDog, contact us by completing and submitting the form below. If you are looking for a specif part number, please include it with your message.